It’s hard to believe that religious hatred is still rife today in the world, but, sadly, it is. It’s not just restricted to the fanatics that you see on the daily news either; there is also a growing undercurrent of mistrust of religion among the average atheists on the streets too. I do believe that a lot of this hatred and mistrust comes out of ignorance, so, I continue with my exploration of different faiths with a brief look at another religion that I knew very little about; Sikhism. Here are ten things that I have found about Sikhism that I didn't know. Sikhism began in the Punjab region, which is now divided between India and Pakistan. It is the fifth largest faith in the world with around 27m followers. 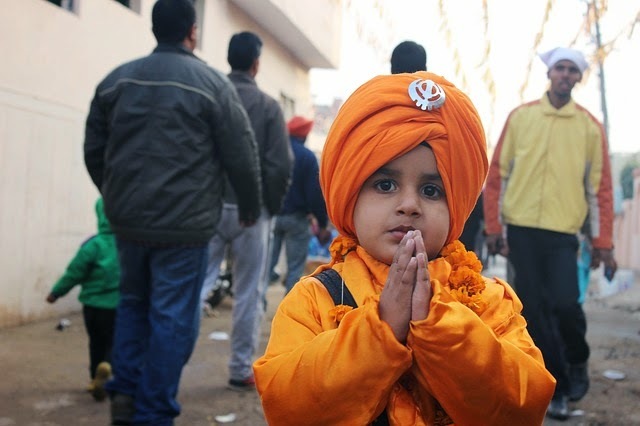 Most Sikhs live in India, but the religion is followed around the world and there over half a million Sikhs in the US. Many people mistakenly think that Sikhism is a branch of Hinduism or Islam or, even a combination of the two. Sikhism is a completely independent religion with its own founder, scripture and beliefs. Sikhism is a monotheistic religion; they believe that there is one God. They believe that there was one creator and that creator watches over creation. This basic belief in a creator is known to Sikhs as Ik Onkar. Sikhs believe that all human beings are equal, men and women and that everyone can reach the divine through honest living, serving humanity and devotion to God. 5. What is a Guru? The word “guru” has come to mean someone who is an expert in a particular field, but the word actually translates as “enlightener”. In Sikhism, “Gurus” are prophets, 10 of whom began the Sikh tradition. The first guru was Guru Nanak, who was born in 1469 CE. Sikhs believe that everyone and everything has the divine within them and they aim to seek that divinity in everything that they do. The tradition seeks to challenge inequalities in the world and Sikhs believe that everyone belongs to one family. The Sikh equivalent of a church, or mosque, is called a Gurdwara. This is where Sikhs come to worship together and where a copy of Guru Granth Sahib, the Sikh scriptures, is kept. In a Gurdwara, everyone removes their shoes and, women cover their heads. After each service, Sikhs enjoy a communal meal together called a langar. 8. Who don’t Sikh men cut their hair? Sikhs do not cut their hair because they believe that is the way that God made them so, they shouldn’t change that. The hair does stop growing when it reaches a certain length and men keep their hair tidy and neat by rolling it on the top of their and wearing a turban. 9. Do Sikhs have a bible? The Sikh equivalent of the bible is called The Guru Granth Sahib, which is a collection of the writings of Guru Nanak and other Gurus. It is also contains pieces that were written by Muslim, Hindu and Sikh saints. The holy scriptures of the Sikh tradition are read in their entirety during Sikh festivals. As I began this series of articles on the various world religions to promote, in my own small way, a bit more religious tolerance, I was interested to learn that Sikhs have a pluralistic view of other faiths. They believe that enlightenment can be reached through other religions too. Perhaps other religions could learn something from the Sikh traditions. I am writing these articles on religion, primarily, as a way of educating myself and also to inform other people of different faiths. If I do get anything wrong about your religion or, you think that I should have included something else, then please don’t take offence, let me know in the comments.